For every 100 business plans that come to a venture capital firm for funding, usually only 10 or so get a serious look, and only one ends up being funded. The venture capital firm looks at the management team, the concept, the marketplace, fit to the fund’s objectives, the value-added potential for the firm, and the capital needed to build a successful business. A busy venture capital professional’s most precious asset is time. These days, a business concept needs to address world markets, have superb scalability, be made successful in a reasonable timeframe, and be truly innovative. A concept that promises a 10 or 20 percent improvement on something that already exists is not likely to get a close look. Many technologies currently under development by venture capital firms are truly disruptive technologies that do not lend themselves to being embraced by larger companies whose current products could be cannibalized by this. Also, with the increased emphasis on public company quarterly results, many larger organizations tend to reduce spending on research and development and product development when things get tight. Many talented teams have come to the venture capital process when their projects were turned down by their companies. The Venture Capital companies obtain their funds from investors. These are institutional investors, the parent companies of the Venture Capital companies, private individuals and other parties as discussed in the previous pages. Their money is comprised in a fund, which is managed by the Venture Capital company. The management decides to invest this money into investee-companies. In addition, the Venture Capital companies can provide their investees management skills, contacts and market access. If appropriate they find them external managers. VC companies are an active partner to the investee company e.g. by providing know-how and obtaining a network, in order to promote the companies growth and general business stability. This is reflected by representation in the board, act as management consultants and as financial advisors in certain projects. This management support is an important feature that differentiates Venture Capital from other sources of finance. The investees are often highly innovative companies in their growth phase that lack sufficient senior management skills. The Venture Capital firms get their returns mainly when they sell out their stakes in the investee companies. Often this is done in the course of an IPO (Initial Public Offering). However, the entrepreneurs most of the time complain that they are under valued and the venture capitalists take advantage of using more sophisticated tools in valuing the companies. But on the other side, the venture capitalists claim that there is a information asymmetry which causes the entrepreneur is more informed about what is going on in the company and he does not share it with the venture capitalist. In case of listed companies, the cost of equity can be determined by using the Capital Assets Pricing Model (CAPM) or some other market equilibrium model. This might be helpful for both the entrepreneur and the venture capitalist to rely on the value of the company. The simplicity of CAPM has made it a standard benchmark in the industry. 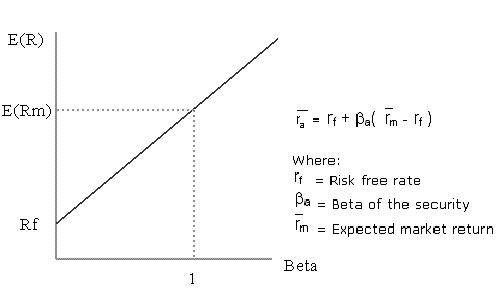 According to the CAPM, the required rate of return (ra) depends on the risk-free rate, the systematic risk of the company is measured by beta, and the market risk premium. Investments are made to a non-listed company and therefore liquidity risk exists. The unsystematic part of the total risk is much greater due to technological risks. The entrepreneur is sometimes forced to invest most or even all his wealth into one project, which makes it difficult to diversify the risks. In that case, he wants compensation for the total risk not only for the systematic part of it. The technological uncertainty declines during the project life cycle, i.e. the risk and thus the required rate of return depends on the stage of the project. Using staged financing instead of lump sum financing reallocates the risks between entrepreneurs and venture capitalists and thus may affect the cost of outside equity. Quite often, the distribution of control and voting rights does not correspond to the distribution of cash flow rights. This, however, affects the risk taken by an outside investor and his required rate of return. On the other side, Venture Capital backed companies can provide high returns. However, despite of success stories like Apple, FedEx of Microsoft, a lot of these deals fail. It is said that only one out of ten companies succeed. That's why every deal has an element of potential profit and an element of risk, depending on the deals size. To be successful, a Venture Capital Company must manage the balance between these three factors that are depicted in the following figure. 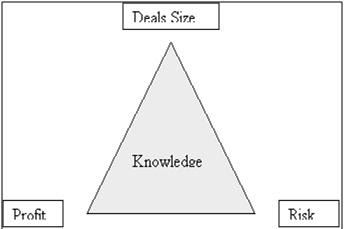 Knowledge is key, to get the balance in this "Magic Triangle". With knowledge we mean knowledge about the financial markets and the industries to invest in, risk management skills and contacts to investors, possible investees and external expertise. High profits, achievable by larger deals, are not only important for the financial performance of the Venture Capital company. As a good track record they are also a vital argument to attract funds which are the basis for larger deals. However, larger deals imply higher risks of losses. As we will show later, many Venture Capital companies try to share and limit their risks. Solutions could be alliances and careful portfolio management. There are Venture Capital firms that refuse to invest in e-start-up's because they perceive it as too risky to follow today's hype. Gavin C. Reid, Venture Capital Investment: An Agency Analysis of Practice, US: Routledge, 1998, p. 6. Joel Cardis, Sam Kirschner, Stan Richelson, Jason Kirschner, Hildy Richelson, Venture Capital: The Definitive Guide for Entrepreneurs, Investors, and Practitioners, US: John Wiley and Sons, 2001, p.11. Kõomägi Margus, Sander Priit, “Venture Capıtal Investments And Financing In Estonia: A Case Study Approach”, University of Tartu - Faculty of Economics & Business Administration Working Paper Series, 44, (2006), p.16.